There is one seafood (Well…, actually more than one) that my husband, who grow up in Colorado, can’t take it. And his families and my kids won’t eat it, either. It is the SQUID. And the squid’s big cousin octopus would even be a nightmare to them. For that reason, I don’t get to cook squid that often. Alas! I l.o.v.e squid. I hope you do, too. Otherwise, I feel like I am so left alone in this world full of squid haters. Behold these lovely squids! Aren’t these boneless creatures cute or what? Koreans love squids. We use them in many ways to enjoy. 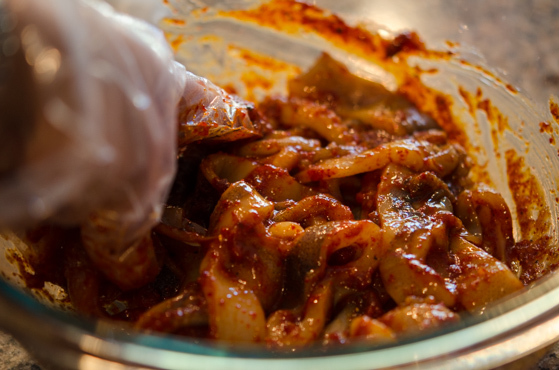 Stir-fried spicy squid is one popular dish most Koreans love. 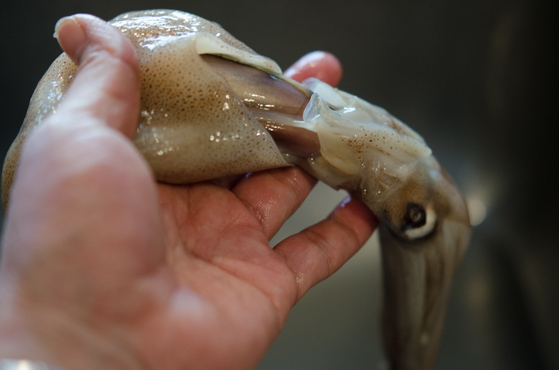 There are several different types of squids you can use depends on where you live and what is available. 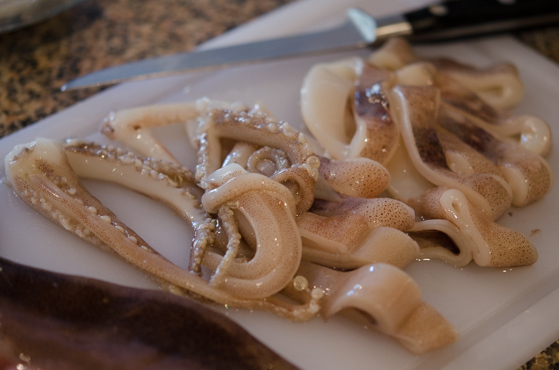 Fresh squids will bring the best result but frozen kind will do a job, too. Look for the squid that has been cleaned already. 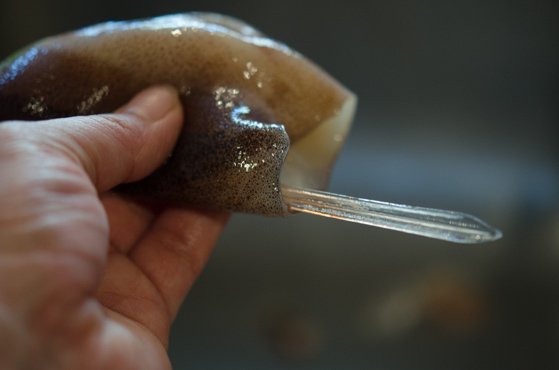 Cleaning a squid yourself is not the most pleasant thing you want to do in the kitchen. I am telling ya! In case you have the fresh squid that has not been cleaned like mine, take a deep breath first before you start. It gets yucky. Just pull the legs out of the body. It will pull out all the gunky stuff from inside the tube. You will also need to pull the eyes out, too. And be careful! It might squirt the black ink on you. This clear plastic-like stick is the only bone structure the squid has. Pull it out and rinse the squid very well. Here is well cleaned squid, my friends! Slice then into a desired size. 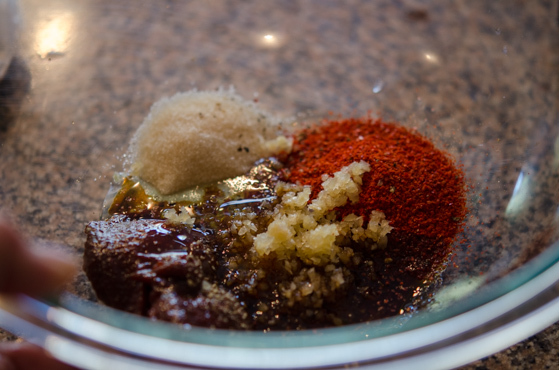 In a bow, mix Korean chili paste, chili flakes, soy sauce, garlic, sugar, pepper, and sesame oil. Add the squid and toss well to incorporate with the seasoning. Set aside. 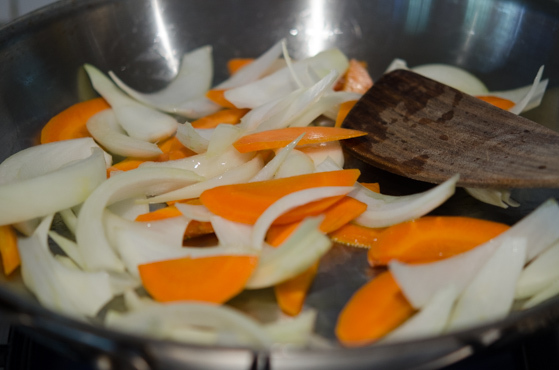 In a skillet over med-high heat, Saute some onion and carrot until somewhat soft. Add the squid and stir-fry quickly until the squid is cooked, about 3 minutes or so. Do not overcook your squid. Otherwise they will get very tough. Sprinkle with some green onion and toasted sesame seeds at the end. That’s all! 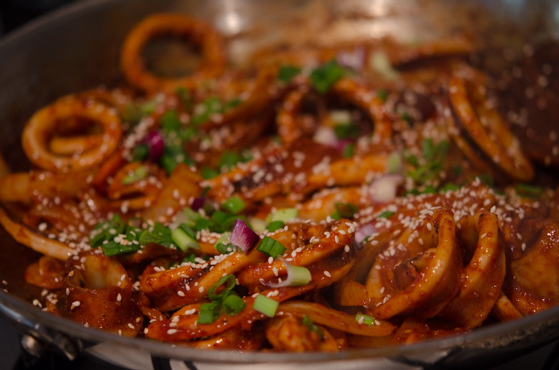 This stir-fried spicy squid can be put together quite quickly as you can tell. Yes, it is spicy! So be prepared with something to cool down your burning mouth. I literally enjoyed my lunch all by myself without sharing with anybody. I was a happy eater. But it would be more delicious when you share with someone you love, right? 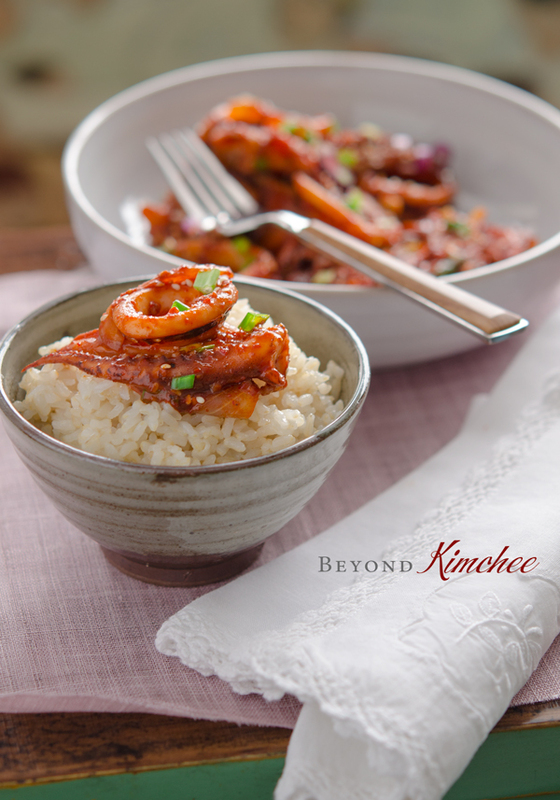 Hope you like this boneless sea creature and get to try the Korean way of cooking. If you do, please take my heart! You, now, become my squid loving friend! In a mixing bow, mix Korean chili paste, chili flakes, soy sauce, sugar, garlic, pepper, and sesame oil until it becomes smooth paste. Add the squid slices and toss well together to incorporate with the sauce. Set aside. Heat oil in a skillet over med-high heat. Add the onion and carrot and saute until just soft, about 2-3 minutes. Add the squid mixture to the skillet and stir-fry quickly until the squid is cooked enough, about 2-3 minutes. Do not overcook the squid. It will get tough. Remove the skillet from the heat and sprinkle with green onion and sesame seeds. Serve hot over rice. I love squid! I've only ordered this at the restaurant so I'm glad I have the recipe now. Tks! Hi Susan, Hope you get to try this at home. 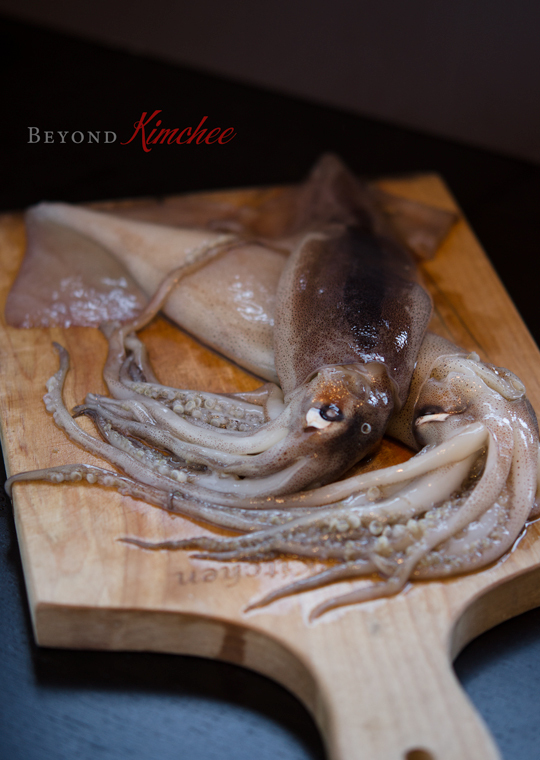 If you love squid, you will love this recipe! Yummmmmm...my mouth is watering as I look at the delicious photos. 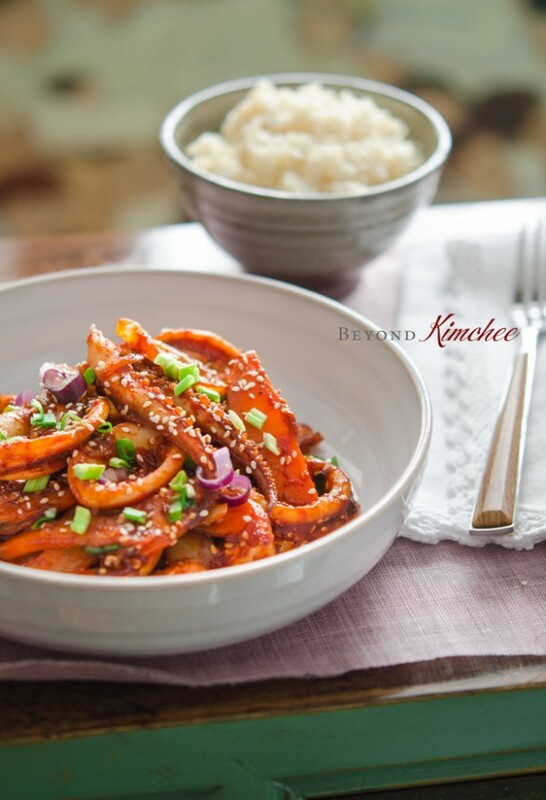 I'm in the same boat as you - this is one of my favorite Korean dishes, but my husband and kids won't go near it. I never get to make it because of that reason, but might just have to cook it for myself. Maybe with some thin noodles ("so-myun"). Thank you for sharing. Somyun noodle is a great choice to go with this squid stir-fry. I feel ya. Sometimes we just need to take care of our cravings, right? Great looking dish! I do like it, but I've had it overcooked more than once -- and then it can be really tough (as you mention). So short cooking (or really long slow cooking) is the only way to go with this. Yeah, if you overcook the squid, they will become very tough. SO either short cooking like stir-fry or long simmering is the best to enjoy. My mouth is already watering thinking of this dish. I love squid. It is a quick dish to cook. Thanks. I love squid. It is a quick dish to cook. Thanks. Yeah, one more squid lover! You are right. 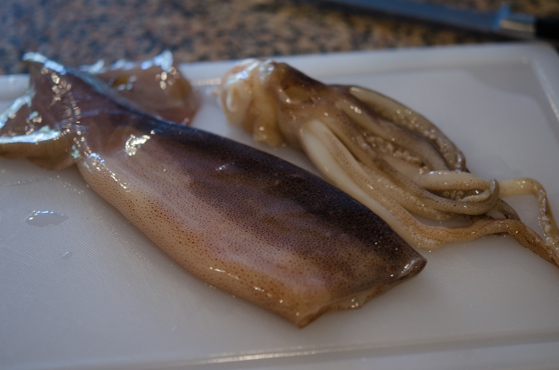 Squid is a great to cook with and delicious! Love, love, love this dish. can't wait to see squid at my grocery store, so I can try this. Everything I've tried of yours is outstanding so I'm sure it will be a hit. Thanks Holly! Hi Julie Great to hear that there is someone who loves squid. And I am so happy that my recipes turned out great for you. Keep your Korean cooking to the max in your kitchen. Holly, this spicy squid looks amazing. And I love squid! It's great in soups and calamari, and now this dish! I haven't made squid myself before, so thanks for the tip about getting squid that is pre-cleaned. you are not alone. also a lot of non korean people love those super beautifull animals, and we love it spicy. best greeting from berlin/germany and the spicy squid lover scene here, and thanks for the inspiration. i learned out of you comments, that i cooked it to hard/hot/long to reduce the juice - so it got little gummy. next time i´m taking more time and "simmer" it :))).